The RS200sd was made for competitive, goal oriented runners who want to enhance their running experience. With the S1 foot pod the RS200sd provides accurate speed and distance data like the S625X so you can combine pace with heart rate data. Use the Event Countdown Timer to manage your training leading up to your next running event. You can even upload your settings to your running computer and then download your workout files to the Polar Running Coach Web Service for analysis. WearLink fabric transmitter included. In order to reach your fitness goals, you need to exercise at the right intensity. Designed for goal-oriented runners, the Polar RS200sd wrist heart rate monitor helps you to easily and accurately measure your heart rate to help you get to just the right intensity or your exertion level. It's great for both beginning runners or more experienced runners preparing for competitions. 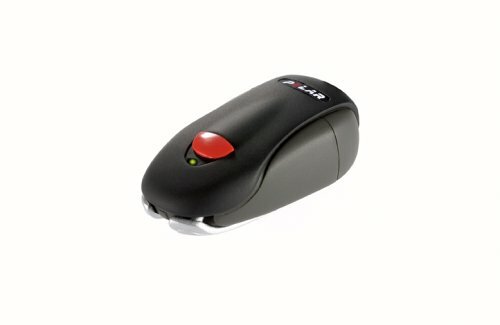 With the included S1 foot pod, you'll be able to take advantage of the RS200's Speed and Distance functions, such as speed, distance and pace per kmph/mph, target pace (with alarms and differential), trip odometer, run distance, totals for mileage, calories and time training, and summaries for distance and speed/pace. Polar Sport Zones: Polar sport zones provides an easy way to select and monitor the intensity of your training and to follow Polar?s sport zones based training programs. The training is divided into five zones based on percentages of your maximum heart rate: very light (50-60%HRmax), light (60-70% HRmax), moderate (70-80%HRmax), hard (80-90% HRmax) and maximum (90-100% HRmax). Polar OwnZone: This feature guides you through an appropriate warm-up routine and automatically determines a safe and effective exercise heart rate zone--your OwnZone--while taking into account your current physical condition. Great Heart Rate Monitor for the avid runner! great heart monitor with lap feature. I've had this watch/foot pod combo for 9 months now and have logged over a thousand miles in that time, so I've come to know this system's ups and downs pretty well by now. I'm happy to report it's mostly ups. In terms of design, the watch (aka "running computer") is exactly what I've been looking for. It's taken Polar a long time to design a watch I truly like, but they've finally done it. What I like most is that its options are almost completely customizable. During exercise, you can set five different screens with three different lines of output (eg, heart rate, pace, total distance, total time, lap time, calories, etc), which is fantastic. In fact, because I can customize each of the five screens, I find that I can put all the relevant info I need on just two and then toggle back and forth between them while I'm running. You can even set the heart-touch function to change screens for you if you wish (whereby, you bring the watch close to the chest strap and it triggers one of three functions - lap conclusion, back light, or screen view). Aside from output, the watch also has a host of other great features, including fully customizable workout routines (eg, free, basic, interval, and user-created). What I've done is create "Easy", "Long" and "Fast" routines, each with a different heart rate range so that I can easily monitor my effort without having to think. The watch also has a "sleep" mode, where you can turn off the watch when not in use to conserve battery power, as well as other key features like a fitness test (which measures your resting heart rate (RHR) and VO2max) and even an event countdown calendar. I now know at any moment how many days I have before the San Francisco Marathon (my first). It's a true motivator and really nice touch. Polar really did think of everything with this watch in terms of design. Perfect. The foot pod is also well-designed. Physically, it's very sturdy and feels like a smooth round rock you might find at the bottom of a stream. It's actually larger and seemingly heavier than I expected it to be, which concerned me at first, but after attaching it to my shoe, I literally could not tell it was there. As a result, it's the best of both worlds: rock-solid sturdy but unnoticeable while running. Another great feature is that the foot pod will automatically turn off after a certain period of inactivity, again conserving battery power. Great. Not much to say on the chest strap, except that it's infinitely more comfortable than the previous design and seems to work well (I haven't had the problem of having to clean the contacts before every use as one reviewer mentioned; I merely wet it before starting, and then lightly wash it in warm water when finished). 1) It took me a LONG time to calibrate the foot pod. Initially, I did as the manual suggested and ran around a track at a medium pace for 1200 meters (three laps). At that time, the calibration read 1.093, meaning that I was covering 1,093 meters for every 1,000 meters the foot pod was detecting. This is quite a margin of error, especially because Polar stated the foot pod should be 97% accurate right out of the box (implying that any calibration should end up somewhere between 0.970 and 1.030). This clearly was not the case for me. Worse still, the resulting mileages were way off when I actually ran known distances. Thinking hills could affect the calibration, I proceeded to recalibrate on a variety of courses and at varying distances (up to as much as 10K/6.1M). Every time, I got a different reading, ranging from 1.004 to 1.027. Finally, through triangulation and a bit of interpolation, I arrived at a manual calibration of 1.010, and it now seems to be accurate within +/- 2 meters per kilometer. Still not perfect, but certainly closer to the 99% that Polar claims you can achieve with individual calibration. So, what's the moral of the story? If you only need/want approximations of your running distances, the foot pod is great right out of the box. However, if you're competing and need/want more accuracy and precision, expect to make a concerted effort. Incidentally, I recommend calibrating on courses that most reflect what you normally run and at as long of a distance as you can stand while maintaining good form. Doing so should help improve the accuracy. Also acknowledge the fact that changing shoes and/or courses (eg, from asphalt to grass) will affect the mileage output, thus resulting in the need to recalibrate. Fear not, however, because you'll eventually become more efficient at knowing how to find your best calibration. 2) Another niggle is that the watch freezes up or blanks out from time to time (half dozen times over the past 9 months). This is especially annoying during an important training session because you not only lose that day's data, but also because you have to stop what you're doing to reset it. Unfortunately, you cannot simply remove and replace the power source like you can on other electronic devices (eg, pulling the plug on a computer and then replugging it in to reboot); you have to do a "global reset", which involves pushing all four buttons side buttons simultaneously (not an easy trick for the less dextrous among us). In any event, I have since learned to do a preemptive global reset if I have a race or an important training session ahead of me that day, especially if I haven't had an "episode" in many weeks. The good news is, you don't lose any of the data stored previously thank goodness, just that day's. 3) One final (small) annoyance is with the footpod. It doesn't have a (sufficient?) low battery indicator, so you never know when you'll have to replace it's 2 AAA batteries. If it dies mid-run, you're out of luck. Like with the watch freezing, I change batteries if they've been in more than 20 hours of use and I have a big run ahead of me that day.